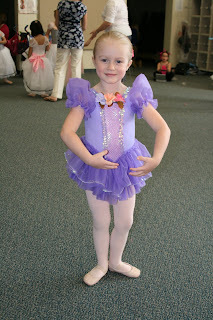 ...4 year olds make the cutest ballerinas! During the morning rehearsal...practicing the final bow. Again during rehearsal... look at that form! I brought my computer and a couple of movies to the rehearsal, just in case, and I was glad I had when the girls started getting restless. We went out in the hallway for a while to watch Barbie in The Magic of Pegasus! In the holding room prior to dancing. 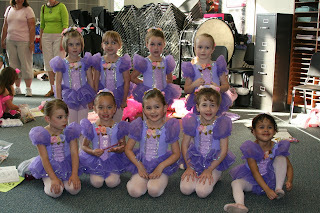 They performed, "Dance of the Sugar Plum Fairies" from The Nutcracker. 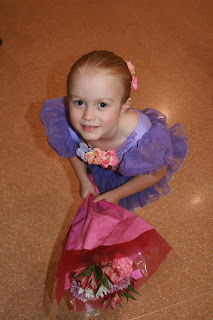 "Emma, show me first position..."
Emma loved the flowers she got from her dad after the performance, although on the ride home she did tell me she thought it would have been fun if the audience had thrown the flowers onto the stage like in her Angelina Ballerina books. It couldn't be any cuter! 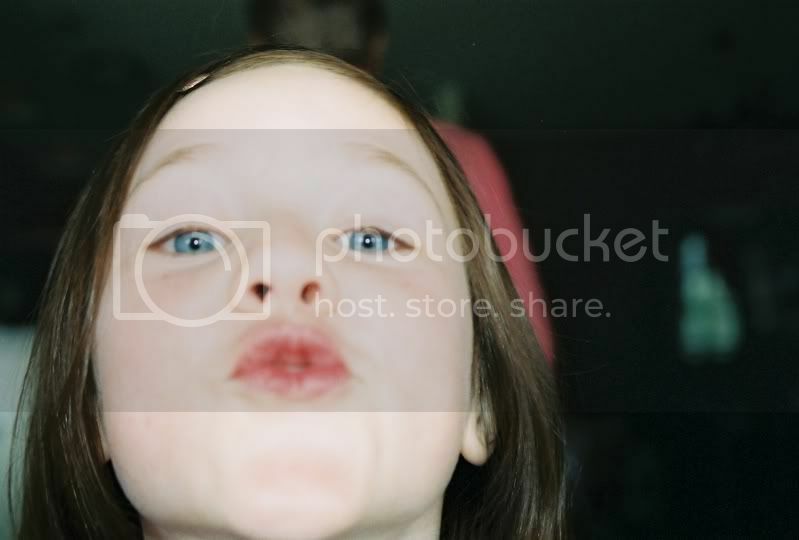 You have to love the face, and all that goes with it! 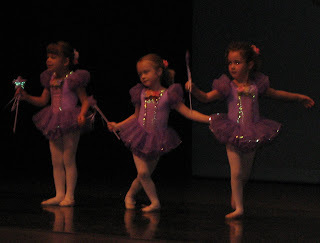 She is an amazing little ballerina. We can't wait until July. the cutest thing ever. what a pretty costume, too! mabel is totally impressed with emma's form. what a perfect little ballerina! How cute! My boss used to teach ballet (when she was younger and a little more graceful, don't tell her I said that!) and when she showed my 5 year old some of her positions Kaylee didn't seem too impressed. 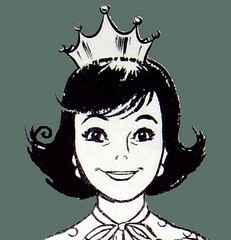 Later I asked her if she liked Cindy's ballerina moves and she replied, "Yes, but she didn't do them very well!" what a perfect ballerina! nice job, emma! I wish we had been there to see Emma! The girls look very pretty and Emma seems to have had lots of fun. These are great shots, I so wish my little one had wanted to do Ballet! I came to you via Kelly's swap blog... Getting to know the group, if you will :) Have a great day! 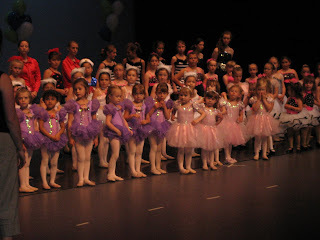 Such a joy to see the performances; my daughter was in ballet for about six years; enjoy every dance move she does. Thanks for sharing all the wonderful photos.